This way to Pipes Beach in Cardiff. All photos by Juliana Jaoudi. 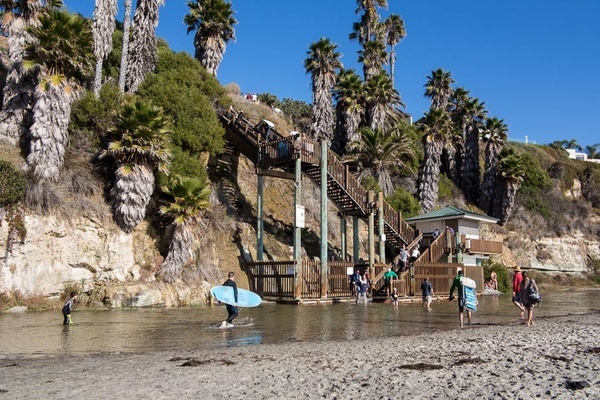 Encinitas, the hippie-meets-high-class beach town in San Diego County, is all about catching rays, coastal rides, ohmming your way to self-realization, fish tacos, and totally relaxing in endless summer style. Local girl and Popupla contributing editor Juliana Jaoudi shows us around. 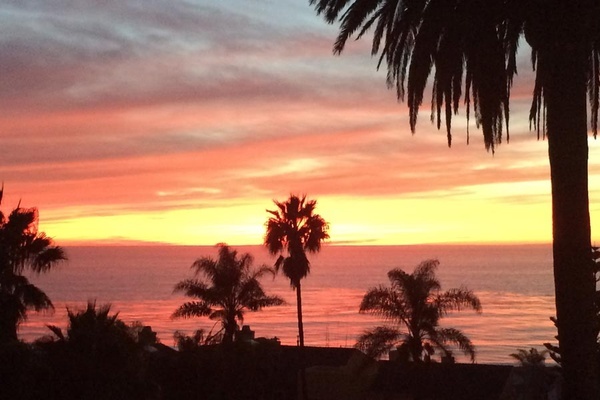 ENCINITAS, California – Encinitas is the raddest California beach city ever. And Cardiff-by-the-Sea, the village within the city of Encinitas, may be even cooler. Locals just call it Cardiff, like the city in Wales. That's no coincidence: It was founded in 1911 by an Englishman (and his wife) who named the major streets after his homeland (see: Manchester Ave., Oxford Ave., Birmingham Drive). My brother, sister-in-law, and beloved niece and nephew live in Cardiff, and I grew up 40 minutes north in Vista. This is why, as much as I love to collect passport stamps, I still spend most of my holidays and loads of vacation time in this part of San Diego's North County, between tony beach towns like Del Mar and the military community of Oceanside, where Marine Corps base Camp Pendleton is located. I come here for my family, but there's so much about this comfortable and delightful lifestyle to attract visitors. Encinitas is defined by its charmingly laid-back, authentic, and high-performing locals who surf, do yoga, train for triathlons, hike, fish, eat clean cuisine, meditate, play golf, farm organic vegetables, grow citrus, self-realize, watch the sunset, and raise their children with excellent public schools and architecturally stunning libraries with ocean views. The towns offer distractions aplenty, but their adjacency to luxury destinations also means you can experience the equivalent of high and low surf and turf. The topography is a pleasing combination of rolling hills and Pacific coastline. The neighborhoods are lined with iconic palm trees; the homes are a mix of old-school bungalows with overgrown bougainvillea and modern structures with tasteful drought-resistant landscaping. 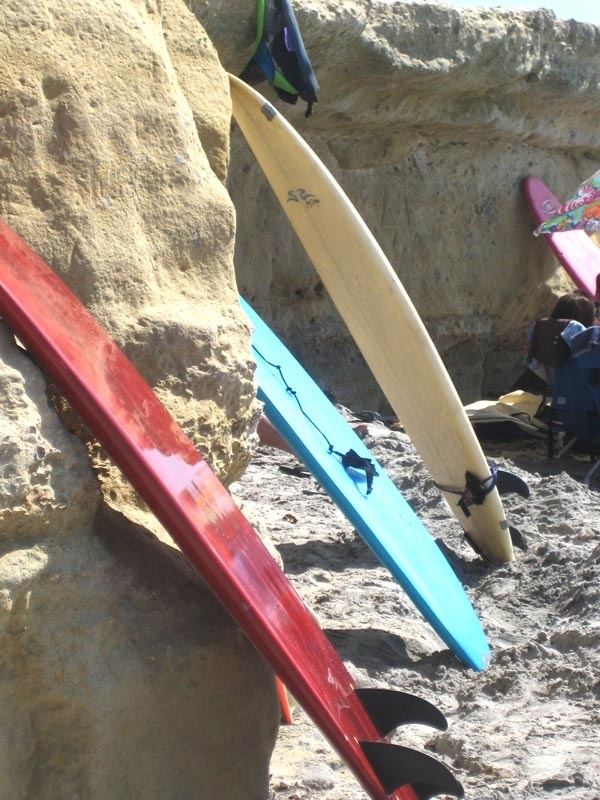 Everyone dedicates space to their surfboards, paddleboards, bikes, and other sand and stay-fit gear. This is truly that place where the locals live an integrated life style. Imagine summertime all the time. That's why you'd come to Encinitas. 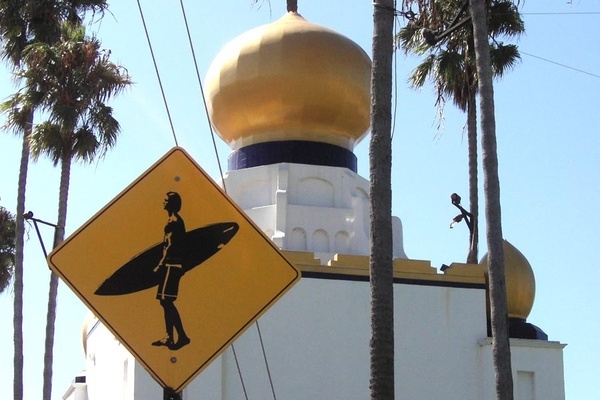 Warning: Surfer crossing at the Self-Realization Fellowship temple in Encinitas. Photo by / Flickr. Encinitas is known for the slightly counter-culture vibe it maintains alongside its affluence and comforts. Ashtanga yoga guru and Encinitas local started practicing here in 1978 with Sri Pattabhi Jois and his son, Manju. Over the years, Tim's Ashtanga teachers developed the dynamic yoga practice that has become the popular vinyasa style. If that weren't yogi enough, in 1937 Paramahansa Yogananda established the above the surf mecca that really is called . Encinitas and Cardiff are also home to champion skateboarders and surfers. (Encinitas made it onto National Geographic's list of the .) Local community leader is one of the top surfers in the world. He's a goofy foot, which means he surfs with his right foot forward, instead of the more common left foot. (You'll want to brush up on your surf lingo.) skateboarding HQ in nearby Vista attracts young talent from all over, like Cardiff native (click to watch his trick in action). Surf's up at Swami's Beach. Photo by / Flickr. Learn to surf like the locals at or . They'll have you riding waves before you leave. If you don't want to get on a board, go check out the tide pools and watch the surfers hang ten at and enjoy the serene salt and freshwater estuaries at . When you're ready to swap a board for two wheels, tour the beach on a beach cruiser rented at . Of special note for families is , for the volleyball courts, beach rentals, easy parking, playgrounds, a café, and restrooms. This is what life is all about. You'll feel the aerobic high from the locals training for triathlons or staying in shape. Running, biking, and swimming are all typical Encinitas pastimes. 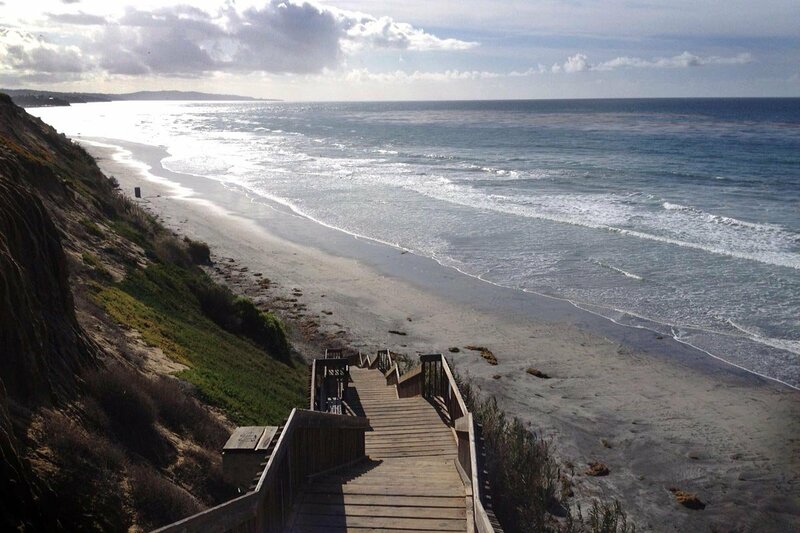 The stairs at Pipes Beach are a favorite ritual: You start at the north end and go south for five sets. Then you do them again on your way back. If this sounds like a killer one-hour workout, it is. Golf, golf, golf! in Carslbad and in La Jolla are gorgeous greens just a short drive away. As you might expect, the area has many, many yoga studios with countless class offerings. has live music on Wednesday nights, has great specialty workshops, is the best hot yoga in town, and has great intermediate and beginner options. Channel your inner Buddha at the , the meditation centeron the cliffs above Swami's. Beautiful gardens, a stunning setting: This may be the iconic Encinitas landmark. The best spas in the area are , , and . For a dose of arts and culture, go see classic and indie movies at , or read a book and enjoy the view at . The stunning view at Torrey Pines State Park. , formerly known as Quail Gardens, is a beautiful spot to sniff exotic flowers from the farthest corners of the world. 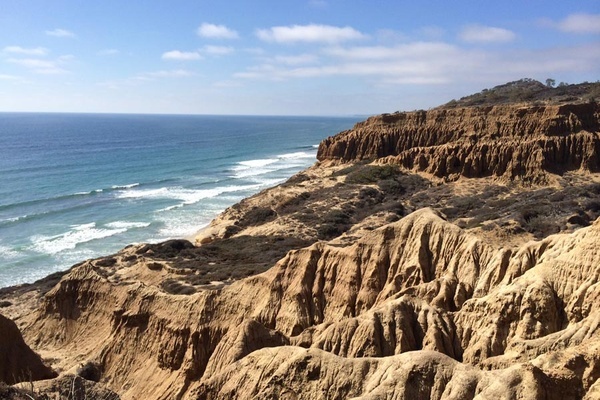 Go hiking through the winding trails within the cliffs of for gorgeous views of Torrey Pines State Beach below. Go see great music and have a drink at , Encinitas' best live-music venue. Make a bet on the horses at the if you're in town during the seasons, July through August and November. Go to the (formerly known as the Del Mar Fair) in June and July. It's just as fun for the kids. If you want the true beach town experience, your best bet is to rent through or and live like a local. is a funky and romantic boutique hotel where every room is decorated in a different style. For the luxury experience, check into . 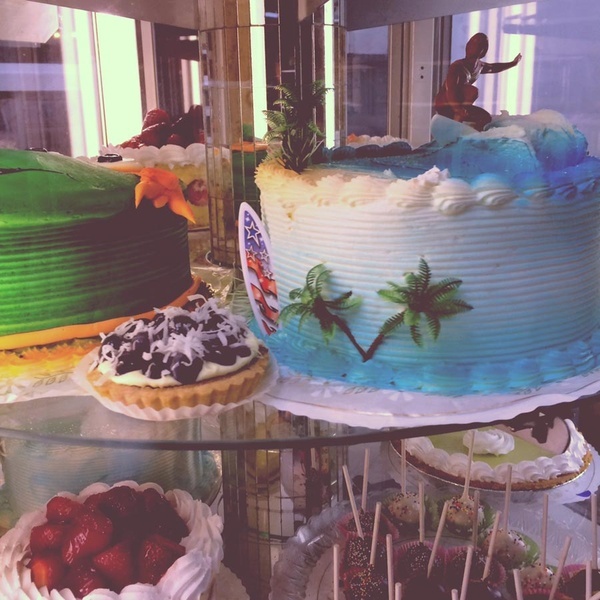 and are also lavish choices worth the splurge, if you don't mind the 15-minute drive from Carlsbad. is great for families who camp. The endless selection at VG Donut Bakery. One of my favorites for the best fresh fish in town, the cool outdoor architecture, and the delicious homemade ice cream. Macrobiotic, vegan, vegetarian, and pescatarian. Includes a juice bar. A local favorite for breakfast, lunch, and brunch, located in an historic train station. Above Moonlight Beach, serving crafted coffee and natural food. The centerpiece is the Japanese cold drip machine that makes Kyoto-style coffee. They roast their own beans and make excellent coffee. A very good ("VG") bakery with a 40-year history serving delicious cinnamon rolls, specialty cakes, and old-school baked goods. A fun spot for dessert after dinner. Where the not-quite-slumming-it San Elijo Campground campers get their supplies. Excellent fresh fish, local produce, gourmet prepared foods to go, and the famous Cardiff Crack: marinated flank steak prepared on the grill in the parking lot on the weekends. My favorite: sashimi salad rolls. Excellent for breakfast and lunch. Varied menu including vegan and vegetarian options. Named for the Self-Realization fellowship and the Swami's surf spot across the street. Some of the best Mexican on the cliffs of Cardiff. Go for the fish tacos. Owned by the same folks who own Bull Taco. Unique pizzas and gluten-free options. Breakfast and lunch only. Outdoor seating makes it really fun for the kids. Hulahoops and outdoor seating: Talk about family-friendly. Cruise up on a bike and check out the extensive menu. A LEED-certified building that's as delicious as it is environmental. Great local food vendors for a dinner spot. Open from 4-7 p.m. in the summer and 5-8 p.m. and the winter. A killer open-air cocktail lounge that turns into a chic, LA-like scene after 10 p.m. If you really want a full night, reserve in advance. My other favorite. A LEED silver certified mixed-use project with killer architecture and an excellent locally sourced menu. Delicious duck breast and vegetarian entrees like toasted quinoa and roasted vegetables. The bar area is beautiful, too. Killer fish tacos and cilantro slaw. Great for breakfast, brunch, and dinner. A truly local and vertical spot. The owners grow their own meat and do their own fishing. Excellent sushi and locally sourced fish. Same owners as Rimel's Rotisserie next door. A great wine list and California cuisine. A popular Gastropub with craft beers. In Carlsbad, have brunch at and drinks and dinner at . 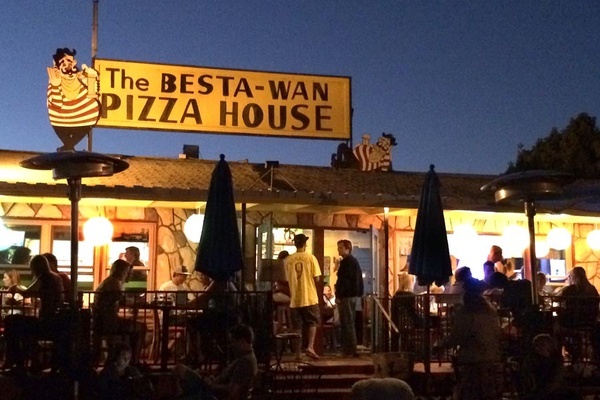 In Del Mar, stop at for its indoor and outdoor restaurants with great ocean views. Or at the classic hotel for drinks, brunch, or lunch on the beautiful outdoor patio and firepit. Goodnight, Cardiff. Thanks for a great day. How to get there: Fly into San Diego Airport (SAN), rent a car, and drive 35 minutes north to Encinitas, or connect from a major city to smaller, regional Palomar Airport (CLD) in Carlsbad. I recommend San Diego airport since it's so close and major airlines like United, Delta, American Airlines, and JetBlue fly directly into the city. For those in-state, it's an easy, just-under-two-hours drive from Los Angeles and a one-hour flight from San Francisco International Airport (SFO), Mineta San Jose International Airport (SJC), and Oakland International Airport (OAK). Renting a car is definitely a must — it's California. When to go/weather: The weather in Southern California is pretty perfect year round, but my favorite is summer time — July through September is the sunniest time of year, and you'll miss the "June gloom". January through May are pretty amazing too, especially if you're keen to escape a cold winter. November and December can be a bit rainy, so check the forecast before you fly. Juliana is a digital media executive and sometime writer/amateur photographer. She lives in New York city but is a California-Parisian girl at heart and picking one is impossible and unnecessary. She travels for the jewelry, local art, and textiles.